← WoW: XP buff coming to the store? I’m talking in this post about taking the time to look up in MMOs, not about UK satellite TV receiver equipment. The skybox is what you see all around you in the distance, the background to your adventures to give the illusion that the game world is bigger than it really is. I do love to stop once in a while in games and look around me, and the skybox has a big impact on how impressive and expansive the world appears to the player. Some games do a better job of making you look upwards than others, here are a few of my favourites. Rift has some very beautiful backdrops, the view from Meridian across towards Lantern Hook in the Droughtlands for instance. The game makes very good use of night and day cycles, plus some impressive weather effects (e.g. blizzards in the Iron Pine Peaks). The most spectacular use of the skybox though is the River of Souls ‘Milky Way’ style effect that featured in the first post launch live event and since in the Raid / Chronicle of the same name. SWTOR has some very beautiful outdoor skyscapes, Alderaan is one of my favourites for natural beauty I think. Beyond that though the cityscapes give a good impression of the hustle and bustle of a world city, see Coruscant or Nar Shaadaa for two examples. But for me perhaps the most impressive skybox use, in my opinion, is on Balmorra. The massive gun emplacements firing at starfighters, and the immense defensive shield over the Imperial base of Sorbik is very impressive. Big things in the sky! 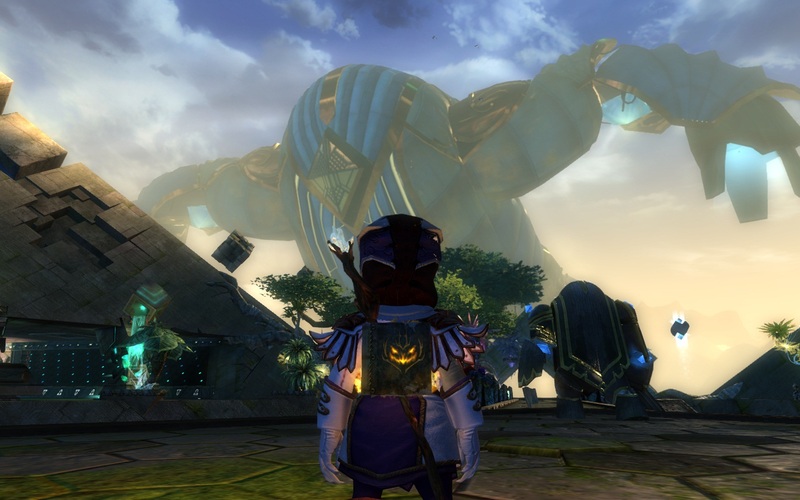 For me the most impressive to date has to be Guild Wars 2. 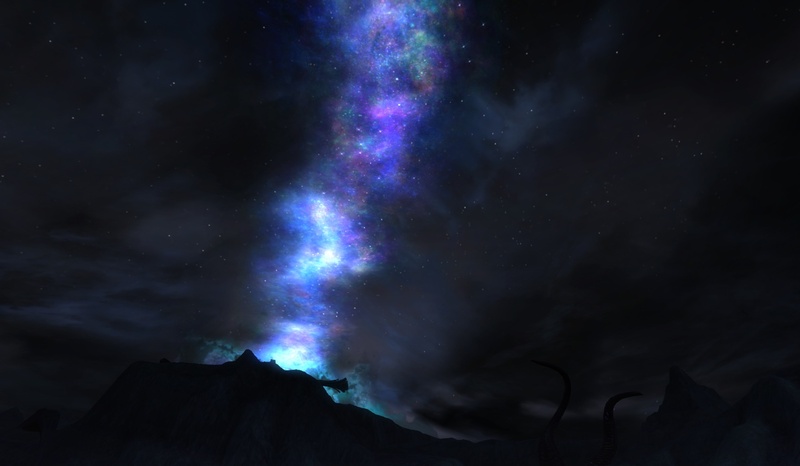 They’ve gone beyond simple fireworks and day/night effects to actually use the skybox for temporary story-content. The holographic dragon over Lion’s Arch for the Dragon Bash festival is impressive enough, but for me the best so far was witnessing the arrival of Toymaker Tixx’s giant flying golem as it swooped down over each city. I’ll keep the list simple at only three examples. I could have mentioned LOTRO’s beautiful landscapes for instance but I think Rift has a slight edge over LOTRO for that. Do you have any examples from other games of good reasons to stare into the distance for a moment or look up into the sky? 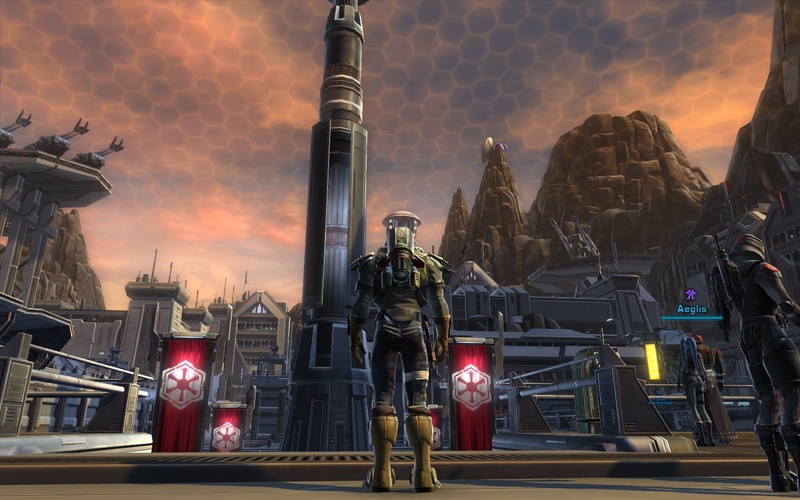 This entry was posted in Guild Wars, MMORPG, Rift, SWTOR. Bookmark the permalink.